The Sub-Continent is eagerly awaiting its share of 2018 monsoon rains ! Every article in this series explains the synoptic situation as it actually is, and based on the day's position, the date and quantum of rains as on THIS CURRENT SITUATION. Initially, in the first few articles, of this series will be chasing and closely following up the actual developments of the monsoon parameters, and analysing its progress regionally for calculating and estimating the arrival date. As on date today, the Mascarene Highs is forming in the required region. A small High at 1031 mb. Four "weak" Lows are tracking in the region. We have to wait for these "lows" to dissipate. Initial forming of SE winds off the East African Coast has not started from below the equator. Weak Easterly flow below Sri Lanka (in the Southern Hemisphere) can be see, though a bit dis-organised. 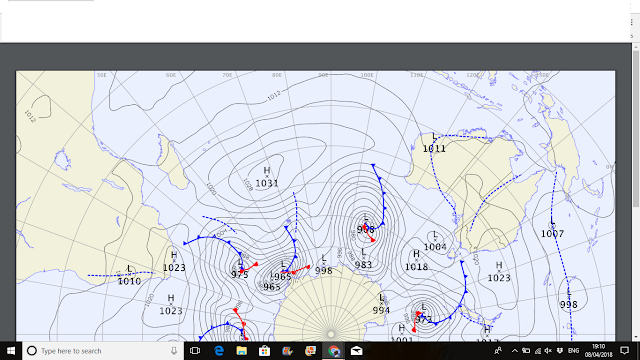 Today, the winds North of the Equator are Northerly (around a "high") in the Arabian Sea, ... and are Easterly in the South of the Arabian Sea. 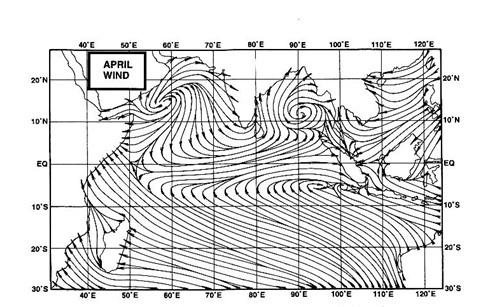 As the Monsoon strikes the Andaman Sea by mid May, developing wind currents ( Westerly) are required to be observed initially near the Eastern side of the Southern Indian Ocean, and this is not forming as of today, Southerly flows are required to strike Sumatra. 2. 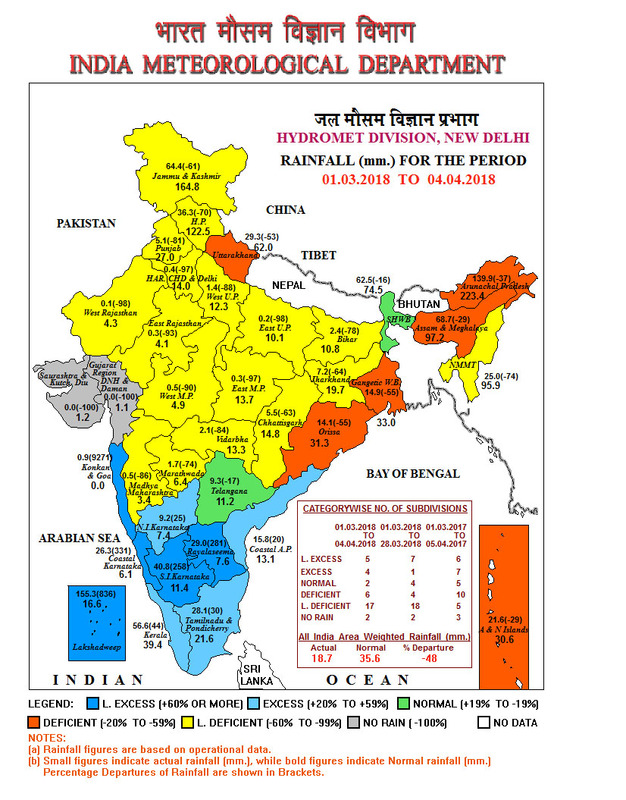 Seasonal Low: Now, this year, the heating in the sub continent has started from March , with Heat Waves in Maharashtra, Gujarat, Central India and parts of NW India.. The above normal heating in many parts continues in April. and, with below normal rainfall...-48%. These are a points in the formation, or a quicker formation of one of the important pre monsoon weather requirement, the seasonal low. Today, the MSL is around 1008 mb in the North Rajasthan/Sindh region. There is a isobar of 1010/1008 mb covering almost the entire Indian region. In the "core seed" area, it is 1006 mb. (The ultimate low in the core, in June when ready, should be 994mb.). This progress is bit tardy. The current Line of Wind Discontinuity (weak in S.Madhya Mah Region) should stabilise around Central India perpendicular down into the Southern Peninsula. This enhances the speed of the Seasonal Low formation. Normally is required to start taking shape for the monsoon by the second week of April. Negative values of the MEI represent the cold ENSO phase, a.k.a.La Niña, while positive MEI values represent the warm ENSO phase (El Niño). The updated (Feb/Mar) MEI has changed to -.502 (in Jan/Feb was -0.731), for a slightly decreased ranking, now moving towards neutral stage. SOI is falling, and is now at + 12.4. Sustained positive values of the SOI above +7 typically indicate La Niña while sustained negative values below −7 typically indicate El Niño. Values between +7 and −7 generally indicate neutral conditions. The Oceanic Nino Index (ONI) is based on SST departures from average in the Niño 3.4 region, and is a principal measure for monitoring, assessing, and predicting ENSO. ONI latest is -0.9... Just marginal, could get lower in the coming months...But at this stage, it cannot be surely mentioned, that an neutral stage could fully develop by June, the onset time of our South West Monsoon. ( 0.5 - -0.5 is neutral. Above 0.5 is El Nino, and below -0.5 is La Nina). La Niña conditions are present. * Equatorial sea surface temperatures (SSTs) are below average across the central and eastern Pacific Ocean. A transition from La Niña to ENSO-neutral is most likely during the March-May season, with neutral conditions likely to continue into the second half of the year. 4. Another pre monsoon seasonal normal requirement is the creation of an initial low in the Bay by the second week of April. This is necessary to trigger off the flow and formation of lows from the bay. Progress this year is bad, (With BB-1 having already been formed prematurely) as the Bay shows no signs today. No forecast of any low as of now. (in 2009,a low formed by the 12th. of April, and later it intensified into cyclone "Bijli", 2010 had no low till 3rd week of April). Today, we have East winds in the Bay. The required SW winds may not yet form at least for the next 4/5 days. Summary for arrival Date: Parameter 1). -ve Parameter 2). -ve, Parameter 3). Neutral Parameter 4). -ve. Summary: Tilted towards slightly Negative, as of 10th April. Parameters analysed as of now show slow progress for Monsoon Advance on time. Every season SWM series begans with your master stroke , current 2018 being no exception. Rajesh sir being doing this since years and he is very consistent in this matter. He is the only one to reply upon as he releases his forecast with detailed and in depth study of each parameter and he is very well in time always before IMD commences its commitment on this count every year. Your indepth analysis is a treasure not only for weathermen but also for a common man as you explain each parameter so lucidly. Pleasure to read your work as always been. Lets hope parameters changes positively as you lift the curtain in the follow up to the first one. I think monsoon will be delayed. By June no La Nina,monsoon below normal. Skymet weather is so excited about the monsoon season . That they keep posting monsoon stories every day.